Chemical Constituents and Components : Main chemical components are anthraquinone glycosides, sennosides, rhein, aloe-amine, kaempferein, iso-rhein, kaempferol, isormamnetin, myricyl alcohol, mucilage and flavonoids. Sennosides: 1. It specifically influences large intestinal motility and show purgative action. 2. It influences both colon motility as well as colon secretion. 3. It shows good intestinal mucosa tolerance. 4. It significantly decreases net water and Na+ absorption and enhanced net K+ secretion. Curing Diseases : 1. 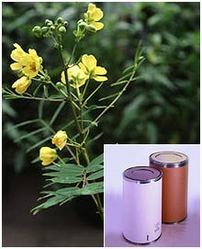 It is used in the treatment of constipation and act as purgative and laxative. 2. It is useful in indigestion, loss of appetite and obesity. 3. It is useful in hepatomegaly, spleenomegaly, jaundice and anaemia. 4. It is also useful in acne, ringworm affection and for inflammatory skin conditions.